During the current restoration of the Deanery, several archaeological finds have been discovered under the floor boards. One of the most interesting is the 17th century trade token featured here as ‘Image of the month’. Dating from 1669, it was issued by Thomas Collings of Eton and bears a fleur-de-lis device. Although the lettering on the token has been worn away in parts, the place of issue – ‘IN EATON’ – is clearly indicated on the reverse and it has been possible to identify the name of the trader by comparing the inscription on the obverse with the Eton trade tokens listed in a 19th century catalogue by George Williamson. 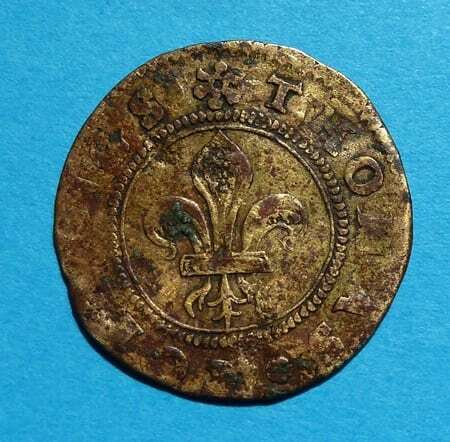 Williamson identified four tradesmen who issued tokens in Eton in the 17th century, only one of whom used a fleur-de-lis as an emblem – Thomas Collings. The fleur-de-lis may indicate a link with Eton College, whose arms incorporate a fleur-de-lis above three lilies, or may have been a reference to his trade, which remains unknown. The inscription on the reverse indicates the value of the token – ‘HIS HALF PENY’ – and the date of issue – 69. 17th trade tokens resembled coins and were used in a similar way to purchase goods and services. The distinction lay in the fact that they were issued by local tradesmen, officials and corporations rather than minted by the central government. 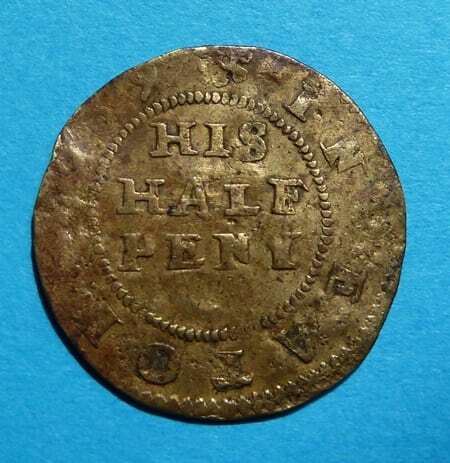 The use of trade tokens originated in the shortage of coins of small denominations which arose during and immediately after the English Civil War. The sparse regal silver half-pennies and farthings in circulation were not sufficient for the conduct of local business and therefore traders sought a “self-help” remedy. From 1648 to 1672 many such tokens were produced and circulated by local tradesmen and, although their issue and use was illegal, the local authorities tended to turn a blind eye. Indeed, some mayors and town corporations issued their own to facilitate commerce. The tokens, made out of copper, brass or other forms of base metal, in contrast to the silver royal currency, shared a common format. They were generally stamped on the obverse with the name or initials of the issuer, with a badge or emblem in the centre usually referring to the occupation of the issuer or, in the case of an innkeeper, the name of his inn. On the reverse the place and date of issue may be found around the edge and the value of the token in the centre. Many were minted in London, whilst others were probably manufactured by local or travelling artists who visited towns and villages, similar to the moneyers of the Anglo-Saxon era. This temporary expedient, devised by the people to meet a perceived and pressing need, came to end with a royal proclamation of 1672 which acknowledged the need for copper coins. The proclamation issued by Charles II “for making currant His Majestie’s Farthings and Half-Pence of Copper and forbidding all others to be used” seems to have been obeyed once sufficient royal copper coins had come into circulation, except in the City of Chester which continued to issue its own tokens until 1674. The trade token discovered in the Deanery in 2014 reminds us of an interesting experiment in “self-help” by the population of 17th century England, Wales and Ireland and commemorates the enterprise of a local Eton trader, Thomas Collings.